So you know that I’m not a huge fan of breakfast foods (my friends tease me because my favorite workweek breakfast is a bagel with chicken salad on top), but I do occasionally like eggs. If I’m going all out, I like to scramble them slowly over low heat with cream, olive oil, herbs and parmesan for a very unhealthy delicious and creamy dish served over asparagus and next to bacon or ham. And sometimes I like eggs in purgatory served next to black beans and tortillas. But sometimes I just want simple, low-fuss eggs but with high-end taste. And Sunday was one of those days. So I threw together this little dish. This is more of an idea than a recipe. A no-recipe recipe, if you will. Guidelines. Suggestions. You know. Anyway, I took two little oven-safe ceramic dishes, or ramekins, and filled each with enough pureed tomato sauce to cover the bottom. Then I sprinkled the sauce with a bit of red pepper flake, salt and pepper and stirred it up a bit. 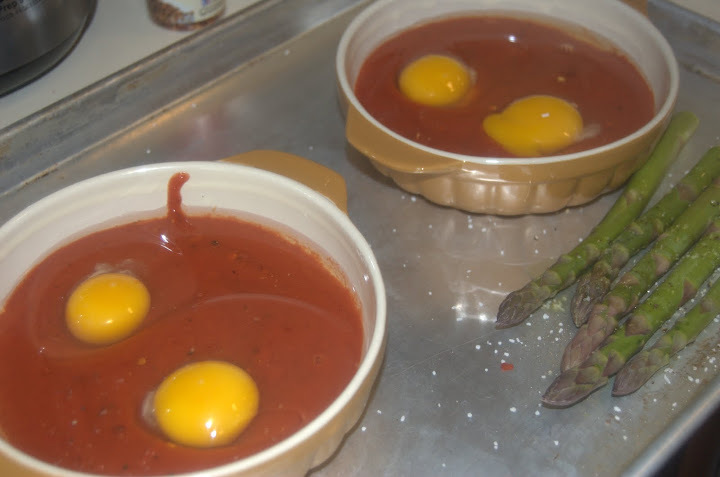 Then I created two small wells in the sauce in each dish and cracked one egg into each well. Sprinkle the eggs with a bit of milk or cream and I put those ramekins on a cookie sheet and into the oven at 400F for about 20-25 minutes, or until the eggs set. While that was cooking, I put a small pot over low heat on the stove and threw in some spices. 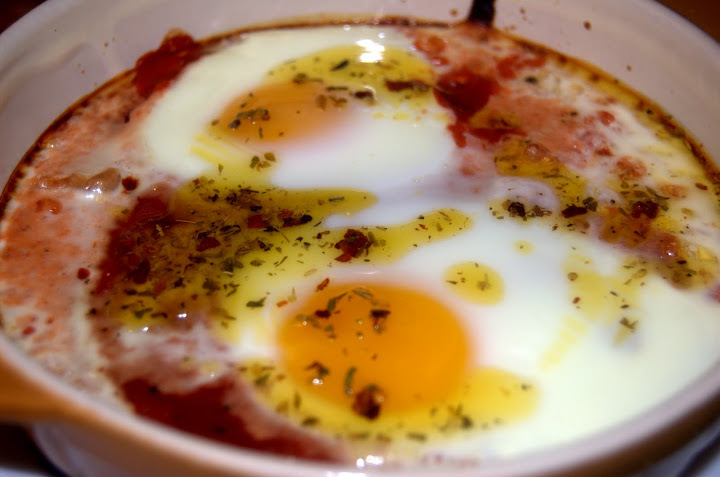 The idea was to create a flavor-infused olive oil to drizzle over the eggs when they were done. 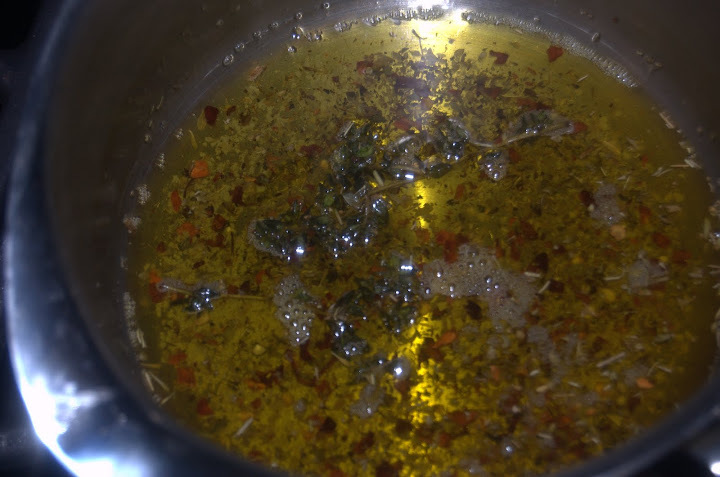 I put in a bit of red pepper flake, some salt, some pepper, some dried oregano and a few sprigs of fresh thyme and then poured about a quarter cup of olive oil over it and just let it sit on the low heat until the thyme was nicely fried and crunchy and the oil was infused. Then I turned off the heat and just let it sit there. When the eggs were done, I spooned the sauce on top. 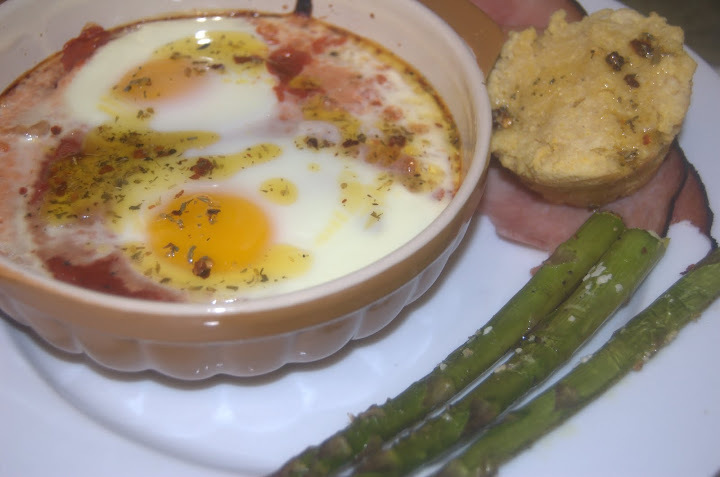 I roasted a bit of fresh asparagus as well (just rubbed it with olive oil, salt and pepper and threw it on the cookie sheet next to the egg ramekins), heated up some sliced ham and served it along side the eggs with a few cornbread muffins. Ta-da. And that is how I do fancy, no-fuss breakfasts. This entry was posted in General Musings and tagged eggs, vegetarian on May 10, 2010 by Lauren.